The Neanderthal brain exists as archaeal colony network which functions as one single organism. It survives by cooperation and the Neanderthal brain forms the basis of human altruism. The Neanderthal brain has prefrontal cortex atrophy and cerebellar dominance. The homo sapien brain has a prominent prefrontal cortex where the complex synaptic connectivity is determined by HERV expression. The cerebellar cortex is non-dominant. The HERV sequences function as selfish genes. The Neanderthals are retroviral resistant due to archaeal hormone digoxin synthesized from cholesterol which modulates RNA editing. The bacteria are altruistic and live as cooperative colonies. The bacterial colony is like a civilization with each area of the colony having specialized function and forming part of the organic whole. The primitive part of the brain the cerebellum has a predominant archaeal colony network and is the basis of altruism and unselfishness. The archaea itself is a symbiotic structure. The cell container is the archaea, the mitochondria – rickettsia, the cytoskeleton and mitotic spindle as well as flagella – spirochaete, the peroxisome – acinetobactor acini and the nucleus – the pox virus. This symbiotic theory of cell origin was put forward by Marguilis. Thus for evolution and survival cooperation, unselfishness and altruism is required. The primitive cerebellar cortex which is dominant in homo neanderthalis is an archaeal colony network. The viruses on the other hand are lifeless particles which spring to life only in the cell. The human endogenous retroviruses are endogenous parasites in the human genome. They function as jumping genes and are selfish elements in the genome. These selfish genes contribute to the dynamicity of the human genome. The HERV contributes to the development of the prefrontal cortex. The prefrontal cortex is dominant in homo sapiens and is predominantly viral. The HERV dominated prefrontal cortex is selfish, logical and ruthless. 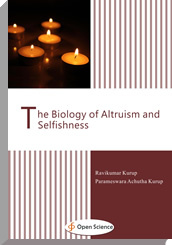 This could be the physiological basis of selfishness and reciprocal altruism.